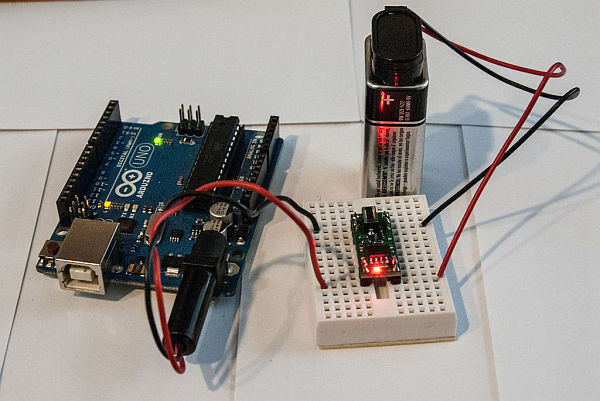 If you need an Arduino to shut off from within your Sketch, this is the solution. We will explore wiring the Pololu Pushbutton Power Switch, programming the Arduino to shut off the power, and making the unit “power on” only. The Pololu Pushbutton Power Switch comes in two versions – the SV version geared towards 4.5V-20V range, and the LV which specifies 2.5V-7.0V range. I will use a 9V battery for this demo, and thus the SV version of the power switch. The power switch has 2 connectors each for GND, VIN and VOUT, allowing multiple attachment points for your projects. A digital connection labeled OFF allows a 5V signal to turn the unit off. The kit comes with 0.1″ headers, making insertion into a Solderless Breadboard effortless, or into a 18-pin DIP for your project. It also sports 2 connectors for a momentary contact switch, allowing you to use the provided switch directly on the board, or solder your own leads for a switch (or switches) separate from the unit. Pressing the momentary contact switch should power up the Arduino. A second press should turn it off. This is the same behaviour as a standard On/Off switch. You can choose to either solder the included momentary contact switch to the PCB, or wire it separately to the Breadboard. Wiring it separately means you can use a different momentary contact switch, and/or mount it to your project cabinet. In the early shots of this project, I mounted the momentary contact switch to the PCB for simplicity of the photos, but in the later shots the momentary contact switch is mounted on the Solderless breadboard.